New Delhi: Chirag Dilli is set to become a major exchange center for Delhi metro travelers in South Delhi, as the long-awaited remaining 25.6 km section between Kalkaji Mandir and Janakpuri West is expected to open in mid-April. Near the busy intersection of Chirag Dilli is a Metro station that will serve areas such as Panchsheel Enclave, Masjid Moth, Sheikh Sarai, Villa Chirag Dilli, DDA Colony, Krishi Vihar, etc. In fact, the Chirag Delhi metro station is going to be an exchange station for Lajpat Nagar’s proposal for the Saket G-Block corridor of Phase IV of the Delhi Metro. Meanwhile, the proposed corridor would connect the Magenta line to the next pink line (Majlis Park-Shiv Vihar). Officials at the Delhi Metro Rail Corporation said that although the Delhi metro stations are generally located a kilometer away, the Chirag Delhi station is only 500 meters away from the next Greater Kailash Metro station. “The distance between the stations is unusually short, a station in Chirag Dilli was required considering the huge catchment area in its vicinity and for the many residential areas it would also provide connectivity,” the official added. 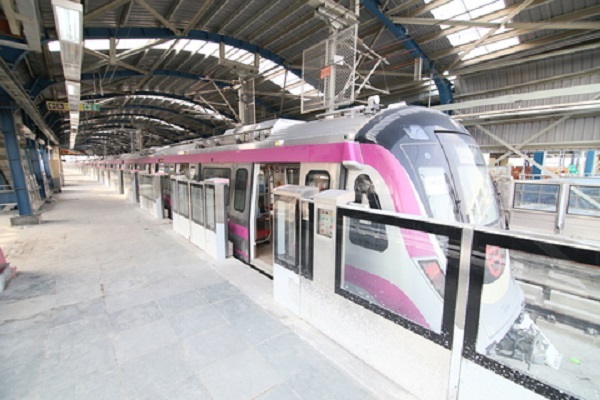 In addition, it has been considered that the number of passengers at the Chirag Delhi metro station would be around 20,000 per day and four lapses per day when the entire Magenta line becomes functional, an official said. He added that six coaches of a train without a driver will run in the corridor of 38.22 km. “In addition to the residential areas, the station is also close to the forest of the city of JahanpanahAt present, the large green area is visited only by the locals, but when the Metro station is opened, it will be accessible to people of all the city, “said the official. additional. DMRC said it has also improved the road infrastructure and the geometry of the Chirag Dilli intersection. “The geometry of the road has been modified for better circulation of traffic, we have created islands of traffic at the intersection, as well as two new access roads,” said a DMRC official. There would be a total of five entry and exit points to the station. While two entry and exit points are on the side of Chirag Dilli, each is on Panchsheel Enclave, Masjid Moth and the forest side of the city of Jahanpanah. “The station would be connected through the metro from these points of entry and exit and can also be used by those who want to cross the street as they fall in the unpaid area,” said the official. The longest of these meters is the one that connects the station with Masjid Moth, which is 120 meters long. “The construction of these meters was a big engineering challenge due to a large amount of services that had to be changed.” Another important challenge was the base of the Chirag Dilli overpass, which we had to avoid, “the spokesperson said. “We had to find gaps between the foundations of the pillars of the overpass, which required extensive coordination with the civic agencies,” he added. While most of the underground stations on this stretch of the Magenta line are at a depth of 18 meters, the Chirag Delhi Metro station is 21 meters below ground level. “We had to reduce the alignment since there was a drain right next to the station,” the official said.